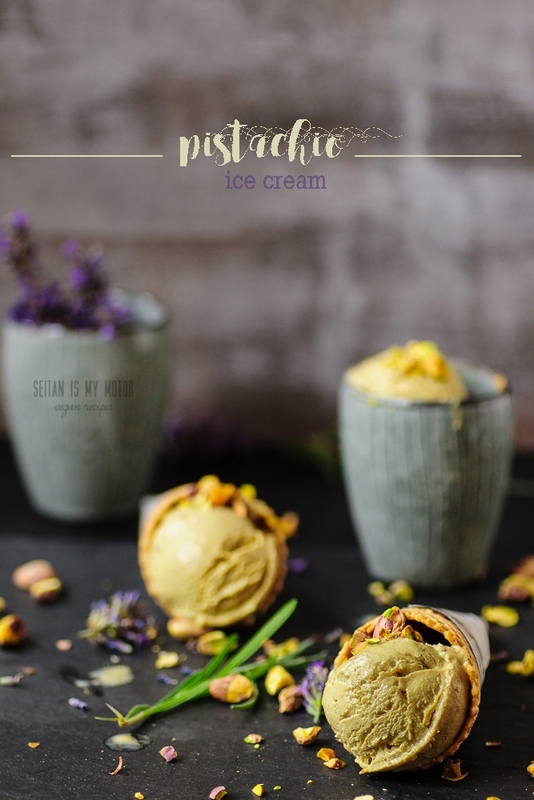 Pistachio is one of my favourite ice cream flavours. It’s a flavour that is not available at every ice cream parlour and at some it is more expensive than regular ice cream. 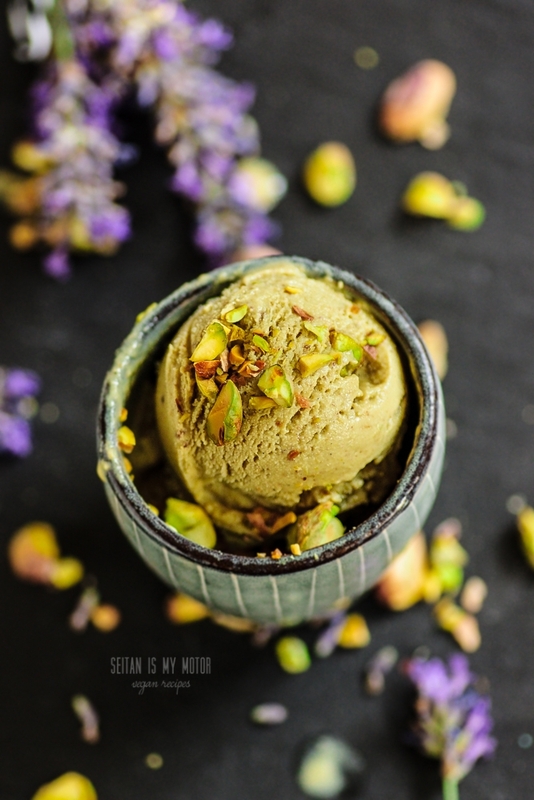 But I would absolutely pay the extra price if there were vegan pistachio ice cream options available. But they are not, at least not here in Dresden. Here in Dresden vegan ice cream is a sad, sad business. You can choose from either sorbets or really, really bad chocolate and vanilla soy ice creams. Oh, or you can just choose another sorbet. Ice cream is important and I want good ice cream. Also, did I already tell you how much I hate bananas in an ice cream recipe? Really, I cannot stand banana ice cream and if it were me, that stuff wouldn’t be called “nice cream”. It would be called what it is. Frozen banana mush. Yeah, turns out I am an ice cream snob. And that is probably because I grew up in a tiny village with no ice cream parlour anywhere. If we wanted ice cream, we had to wait for the little ice cream car that drove through our street during the summer months. That car came almost every evening and announced itself with a loud and funny car horn. The man who sold the ice cream always opened back doors of the car as soon as the kids from the neighbourhood came running out of their houses. He had about eight different flavours in there and none of them was pistachio. Instead he sold the basic and solid varieties like lemon, strawberry, chocolate, vanilla, stracciatella, etc. For us kids that was more than enough. That ice cream usually was the perfect ending to a long summer day that we had spent outside alone, just strolling through the village and its surrounding nature. To me eating an ice cream was part of that freedom we had at home. We live in a city and I often miss this freedom for my kid. She always has to watch cars and she’s yet to small to walk around alone. But her freedom is probably the huge (non-vegan) selection of ice cream flavours she can get here. Her recent favourites include cinnamon, cappucchino, and of course pistachio. And while I think it’s unfair that she cannot grow up in the countryside, I also think it’s unfair that my vegan ice cream choices are so limited. But not today. 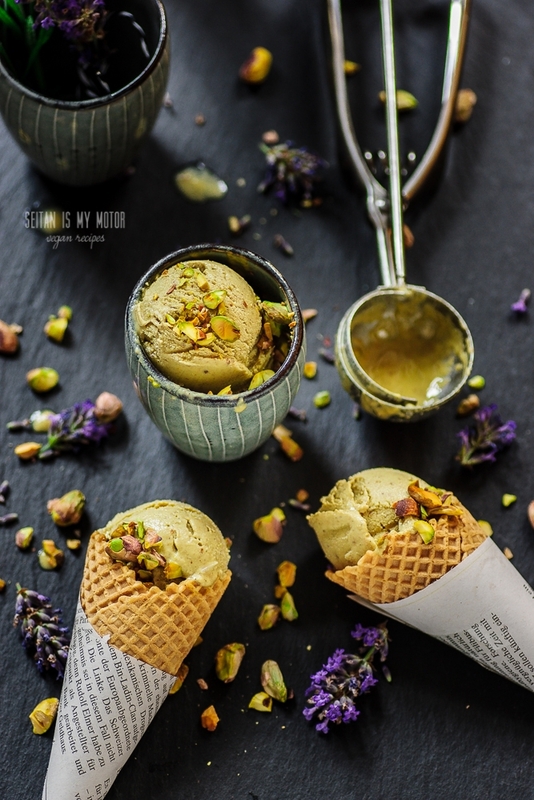 Today I have had a huge serving of really good homemade pistachio ice cream. And I am gonna share it with you no matter if you live in a tiny village or a large city. This ice has only four ingredients and is soy- and gluten-free. To reduce the costs a bit (over here nut prices are ridiculous at the moment), I bought two bags of unshelled pistachios (250 grams each) and shelled them myself until I had about 180 grams (1 1/2 cups). It doesn’t matter if your pistachios are salted or not, you will have to soak them over night and if you rinse them the next day, the salt will have washed off. The ice cream will harden in the freezer and it can be hard to scoop. But if you take it out about 30 minutes before serving you will be fine. Rinse and drain the pistachios. Place in the fridge for 2-3 hours. Churn the liquid in your ice cream maker according to the manufacturer’s instructions. Transfer to an airtight container and let freeze for at least three more hours before serving. You made me laugh with your comments on ‘nice cream’. I love bananas so I don’t mind it, though I’ve only whipped it up a few times – usually when I want ice cream I want the real deal too, not a ‘healthy alternative’. I don’t mind ‘nice cream’, but I am in no way fooling myself that it is anything other than cold banana mush with flavours… it certainly has never tasted ‘just like ice cream’. When I am in the mood for ice cream, I am in the mood for ice cream! Oh, and I am SO WITH YOU on “nice cream”. It’s gross and I can’t even imagine kidding myself into believing that it’s a delicious treat when it’s really just sad banana mush.